Voters Hate Money In Politics ... Sort Of : It's All Politics Voters overwhelmingly tell pollsters they dislike how much money is in politics. But they don't consider it a major issue. Senate Majority Leader Harry Reid of Nevada (left) talks with Senate Minority Leader Mitch McConnell of Kentucky. The two Senate leaders were on opposite sides of a proposed constitutional amendment to limit fundraising and spending in campaign politics. The United States Senate voted down a constitutional amendment Thursday designed to limit money in political campaigns — exactly the opposite of what most Americans say they want. 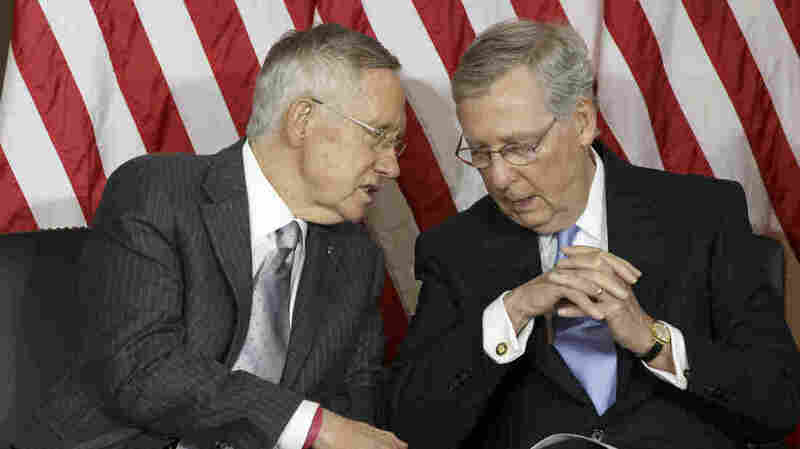 The result was a foregone conclusion: Majority Leader Harry Reid and his Democrats voted in favor; Minority Leader Mitch McConnell and his Republicans voted against it, arguing that it would infringe on the right to free speech. The idea was always a long shot: As a constitutional amendment, the proposal would have needed 67 votes in the Senate to pass, then a two-thirds majority in the House (an unlikely scenario), followed by ratification by three-quarters of the state legislatures in the country. In theory, this vote should mean trouble for Republicans, heading into the November midterm elections: Americans consistently say they believe there's too much money in politics. Polling shows that voters overwhelmingly would like to see limits on both donations and spending — in other words, they support exactly the kind of legislation that the proposed constitutional amendment would permit. In practice, Republicans know they will face almost no consequence at the voting booth. That seeming contradiction is best explained by voters' intensity on this issue — or lack thereof. Glance at any poll asking Americans to rank their top issues. This week, both the Washington Post/ABC and the CNN/ORC surveys put the economy or jobs at the top of voters' worries, with about one-third of respondents calling it the most important issue. Health care, terrorism, the dysfunction in Washington, the situation in Syria, immigration and even education crack double digits. Where does campaign finance or money in politics rank? That would be nowhere — perhaps buried in the catch-all of "something else." In other words, while voters — including a strong majority of Republicans — agree that political campaigns consume too much money, and the wealthy and corporate interests have a disproportionately loud voice in campaigns, they do not feel very strongly about it. It's more of an abstract worry than a concrete, bread-and-butter concern. "For a lot of people, because of the way they sort of view politics as not necessarily something that's integral to their life, 'too much money in politics' is basically a nuisance," said Chris Jackson, research director at Ipsos Public Affairs, a polling firm. "It's not really a central issue. It's not a pocketbook issue." Unless and until that changes, rules governing money in politics will remain in the hands of those who live and die by those rules — which means reforms are only likely when both parties feel equally aggrieved by the system. That's what allowed the last major legislative overhaul, McCain-Feingold, to pass in 2002. Many Democrats felt corporate "soft money" was hurting them; Republicans thought union money was hurting their side. Both were banned in the law that George W. Bush wound up signing. Today, the big issue is "outside" money spent directly by interest groups, and in particular, by so-called social welfare nonprofit groups that keep their donors' names secret. Since unlimited campaign spending by these groups was permitted by recent court decisions, Republicans have been the principal beneficiaries. In the 2012 election, the ratio was about 10-1 in their favor. That gap is starting to narrow this cycle, with liberal billionaires funding Democratic-oriented secret-money groups. So far, this has merely let Republicans cry hypocrisy in defense of their own billionaires. But until Republican candidates find themselves getting hammered by wall-to-wall TV ads in key elections by Democratic nonprofits and start losing those elections because of them, don't look for any real consensus to change things.